In a previous article I wrote about a part of the Kimono known as Obi, the sash used to tie a kimono. In that article I discussed the different kinds of Obi that exist, their history and the way they are tied as well as what that meant in terms of meaning and culture. For example, in the Edo period some people had the knot of their sash tied at the front but over time they started tying it at the back. In comparison to women, the Obi for men is a lot simpler and requires just a simple knot, yet still it is amazing how for both genders this part of the kimono is far more complex than it first appears. However, I guess it was only natural, and fair, that I also write about the kimono itself – while it was important to introduce Obi, it is essential to actually discuss more of the background of the kimono itself. Just like the obi, is a beautiful traditional garment that comes in an array of variety, depending on the wearer and the occasion. First of all it makes sense to introduce a brief history of the kimono. Kimono is written in Japanese using the kanji kiru meaning “to wear” (着) and mono, “thing” (物), which is loosely translated in English as “a thing to wear”. So originally the word kimono was simply used to denote clothing. It is only now that Japanese people also wear youfuku (洋服) – western clothing – that the term kimono has become synonymous with the concept as it is thought of today. Actually even the kimono we know and see today has come a long way, and there have been many changes over time. Initially Japanese clothing consisted of an ensemble, a top and some bottoms. During the Nara period (710-794), when Japan was still highly influenced by China, the kimono resembled closely clothes of the Tang Dynasty. It is also during this period that it was made official that collars would be crossed left over right, as it was customary to do so in China. If you’ve ever worn a kimono or yukata you’ll know it is absolutely essential to get this right. Especially because crossing right over left is how the dead are dressed. The Heian period (794-1192) introduced a new development. With the fall of the Tang Dynasty, Japan ceased looking towards China and started focusing inward. A new straight-line cut method for the kimono was developed, and thanks to do this new technique, which simply involved cutting fabric in straight lines and sewing them together, designers did not have worry about the shape of the wearer. This became even more convenient as kimonos could be worn in layers for the winter, or be made with lighter fabric for the summer. 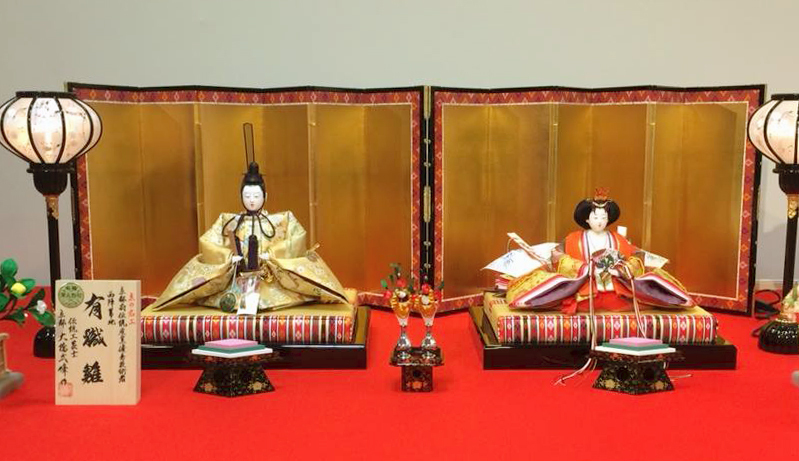 The most famous type of kimono during the Heian period was the juu-ni hitoe (十二単) – 12 layered kimono, a ceremonial kimono worn by the highest-ranked lady of the imperial court. With time, people soon became experimental, and began coordinating different colours together. The different colour combinations were representative of social class, and also reflected the seasons. Colours were specific to age, gender, social status and certain ones were only used during special occasions. This is something you will still find in kimono today. The next shift happened during the Kamakura (1185-1333) and Muromachi period (1336-1573). As you will probably have guessed, all those layers were rather inconvenient. Thus emerged the kosode. Beneath all those layers of clothes, was the undergarment, called kosode in Japanese. Commoners had already adopted this look in the Nara period, but the Samurai class and Shogun only followed suit much later. The reason for this, was it was easier to wear their armour over their clothes, or hitatare as it was called. On the other hand samurai wives wore a pure white kosode and hakama. The shoguns’ wives still layered up, but kept it to five layers instead of twelve. However, the hot summers were too much to cope with, and the women opted for a single layer and hakama for those warm seasons. 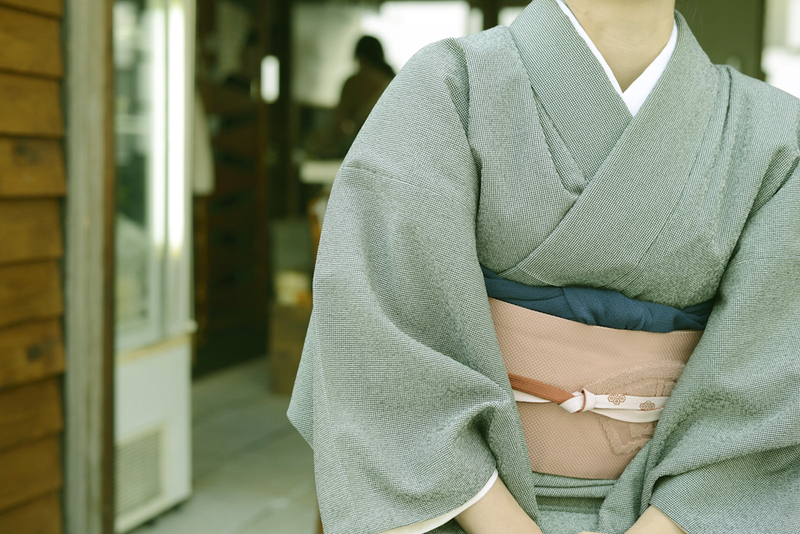 By the end of the Muromachi period, the kimono was getting a bit closer to how we know it today. The extra layers, and even the hakama (for women) were abandoned leaving nothing but the kosode. Without the hakama though, something else was needed to tie the garment together. This is when the obi makes its appearance. An interesting connection with this time period is also how women carried their belongings at this time, previously another writer introduced the Furoshiki, as she discussed this was a common style of cloth to use to make into a bag and carry things until the 1940s, however recently it has made a comeback as it is not only still a great way to carry stuff but also can be used as a kind of unique gift wrapping. 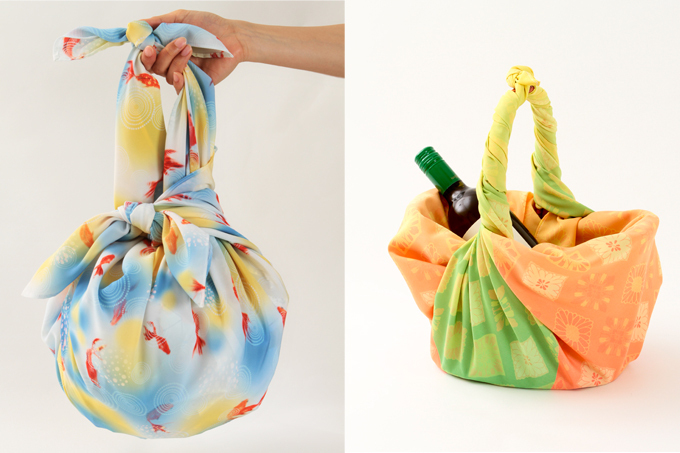 A beautiful video about Furoshiki can be seen on the Japanstore website. When you watch a movie or drama depicting a story from these older time periods you may notice the style of kimono that women wear but also you will often see that they are using a Furoshiki. As we come out of the Muromachi and into the Edo period (1603-1868), Japan once more takes another look towards the outside. From this time new fabrics and new weaving, dying and embroidering techniques emerged and were developed. It is also at this time that we begin to see the appearance of silk and satin. Making kimonos had now become an art, and the kimonos themselves were becoming extremely valuable. Today kimonos come in different styles (for women) and can cost up to several thousand pounds. Traditionally they were sewn by hand, but even those that are not will still require hand stitching and handmade decoration. The work and craftsmanship that goes into making one definitely adds to its beauty and value. 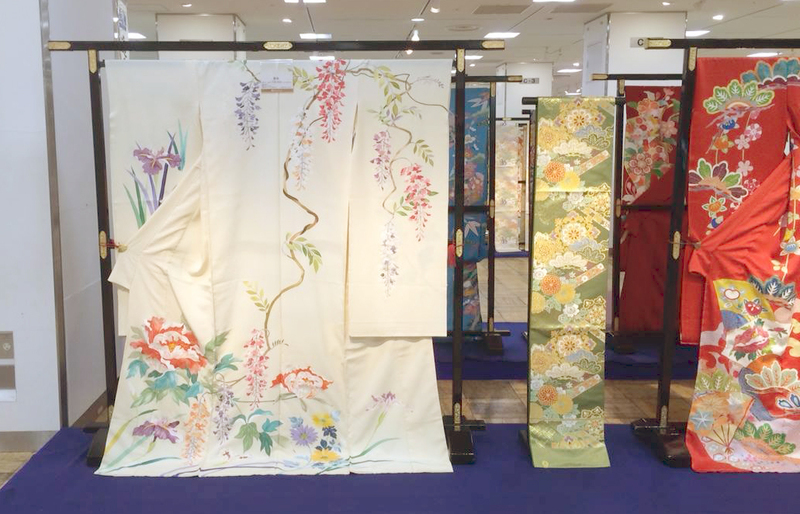 A few different types of kimono include furisode, tomesode and uchikake, and more. Furisode, which literally means swinging sleeve, refers to the long sleeved kimonos worn by young unmarried women. It is a common preconception in Japan that children’s body temperatures are much higher and therefore more susceptible to fever. For that reason, children had longer sleeves which were open at the back to allow for ventilation, in turn helping to regulate the body. Therefore the long sleeves on an unmarried woman reflects her “child” status until she weds. On the other hand tomesode is worn by married women. 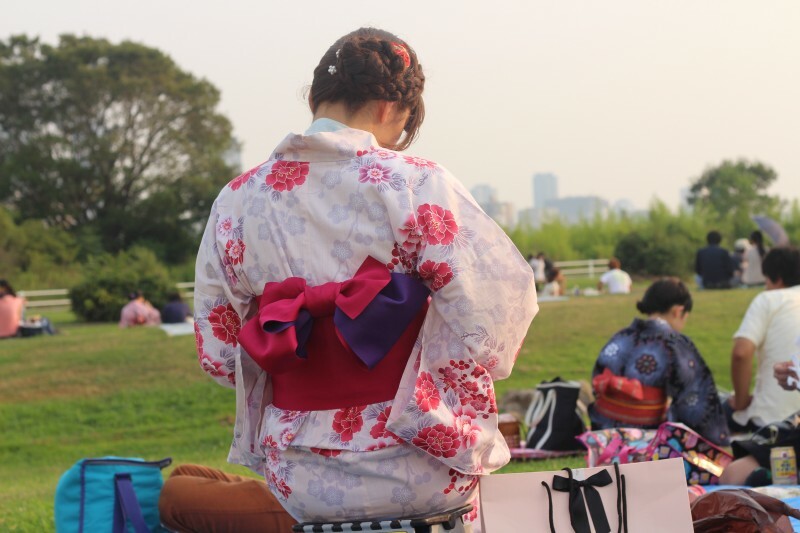 Unlike the more colourful and patterned furisode, it is usually a single colour kimono with shorter sleeves. So what do women wear on their wedding day? Uchikake, a robe worn over the kimono. It is usually long and trails behind the bride with a thick padded hem at the bottom. Just in those three types of kimono, we see how how colours, patterns and designs can reflect the wearer. Just like the obi, I find it absolutely fascinating to see, what is essentially life, reflected in the clothing. Not only is the kimono simply stimulating to the eyes and beautiful, but there is also a story. So next time you see someone in a kimono, pay close attention to the colours, the patterns, the sleeves, and even the obi. This just might tell you a bit about the wearer, whether they’re going to their coming of age ceremony or perhaps to a wedding. Pingback: Japanstore – Overview of 2014 Culture – The Best of Japan!